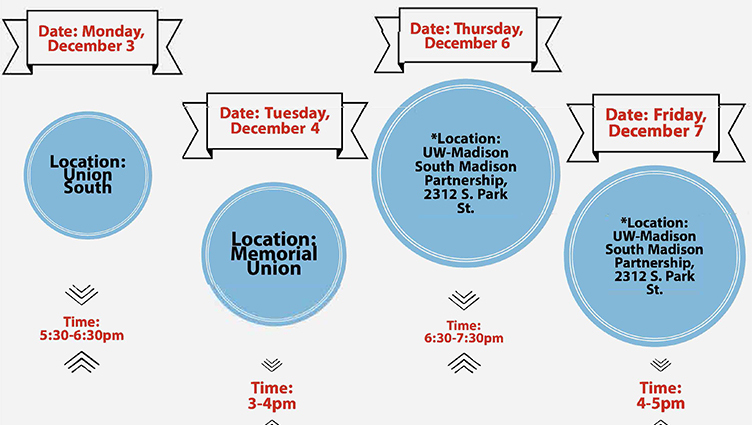 On Dec. 3, the Civic Action Plan (CAP) Initiative will be transitioning from its implementation phase to hosting week-long info sessions. The info sessions will include the history of the Civic Action Plan, introduce the nine recommendations and implementation plan, allow colleagues and community partners to serve on the CAP oversight committee and more. Please consider attending an info session. This post is co-authored by Chancellor Blank and Kathy Cramer, Natalie C. Holton Chair of Letters & Science and Professor of Political Science. Cramer is the former Faculty Director of the Morgridge Center for Public Service who stewarded the creation of the Civic Action Plan. Guided by the Wisconsin Idea, the University of Wisconsin-Madison has a proud tradition of being actively involved in communities across Wisconsin. We consider this part of our mission as the state’s flagship university. A collaborative team bridging campus and community boundaries has produced a Civic Action Plan for the university which lays out a framework for better supporting community-engaged learning, civic engagement and community-campus partnerships. In November 2015, Chancellor Blank signed the Campus Compact 30th Anniversary Action Statement on behalf of the University of Wisconsin-Madison. Campus Compact is a national coalition of over 1,000 colleges and universities committed to the public purposes of higher education. UW-Madison joined more than 450 universities from around the country in reaffirming a commitment to civic education and community development. By signing the action statement, institutions were also asked to create a Civic Action Plan. Here at UW-Madison, the Morgridge Center for Public Service spearheaded the planning efforts and convened a committee of 16 faculty members, staff, students and community leaders. After a six-month process, more than 90 interviews and hundreds of survey responses from a variety of constituents in Wisconsin and on campus, the committee in July completed a plan with nine recommendations. These nine recommendations reflect feedback from our community partners who are instrumental in our daily teaching and research. They provide guidance for better serving local and statewide communities as we continually work to achieve the highest ambitions of the Wisconsin Idea. And just as importantly, the Civic Action Plan helps us better understand how the university can benefit from community wisdom and insight. The recommendations also offer guidance for enhancing civic education in our curriculum and for better supporting faculty members who are engaged in community-based teaching, research and service. We invite you to read the full Civic Action Plan here. • The Morgridge Center will be hiring a new Community-Engagement Preparation Specialist to coordinate and promote campus-wide efforts to better prepare students, faculty, staff and researchers to work with the community as part of academic and co-curricular community-based initiatives by coordinating development, implementation, and evaluation of cultural awareness and community preparation curriculum. • The Morgridge Center launched a pilot program with the Center for Leadership and Involvement focused on the preparation and support of student leaders and members of Registered Student Organizations who are doing community-based engagement and volunteerism. • Mitigate some of the institutional hurdles for faculty and graduate students who are interested in community-engaged work. In order to better prepare, support and incentivize faculty members, the MCPS developed and will launch a new “Excellence in Community-Based Learning Teaching Award.” One of the criteria of this Chancellor’s Faculty Distinguished Teaching Award will be whether community partnerships associated with the course have been developed in an equitable way. Each of these actions are direct responses to the concerns we heard during our research for the Civic Action Plan, and they will make a difference. Of course, we already have many people on campus and in the community who are working together, and the Civic Action Plan draws upon lessons learned from the great work already happening. But we know that, especially as a public institution serving the great state of Wisconsin and the world, we have a directive to continually work with the communities around us. We can use our education and research to strengthen civic engagement, constantly re-evaluating and improving upon these efforts. We would like to thank all who contributed their time and wisdom to this Civic Action Plan. We look forward to working with campus and community leaders as we reaffirm our commitment to strengthening community-campus partnerships and our commitment to the public purposes of our university. If you are interested in learning more about the Civic Action Plan, please consider attending an info session. Feedback can be sent to civicactionplan@wisc.edu.